Choose from over 60 classic flavors, and discover the rich taste and quality consistency in each and every DaVinci Gourmet product, including this sugar free coffee liqueur flavoring syrup! This syrup is sweetened with sugar free, no-calorie Splenda Brand sweetener, to complement your beverages without overpowering them too much sweetness. They are specially formulated to resist curdling in milk and hold up well under heat, making them the perfect choice for espresso-based drinks, coffee, and lattes. It is also great for adding flavor to blended beverages, or cocktails like white russians mudslides at your bar. It can even be used for drizzling atop your cheesecakes and frozen yogurt for the perfect finishing touch, or as an ingredient in a wide array of baked goods! This is great for making coffee flavored ice cream. Although it is sugar free it is still sweet because it is sweetened with a substitute but I'm ok with that. The coffee liqueur syrup is delicious and the best part is that it is sugar free. A great syrup for all to enjoy and makes a great flavoring for shakes or malts. We go through this sugar free flavoring syrup like crazy in our shops. We use it for so many different things too. This is easily one of our most favorite syrups that DaVinci offers. The coffee liqueur sugar free flavoring syrup is very bold. A strong flavoring that is perfect for adding a pop of coffee flavoring into coffee. It is an instant hit. The subtle taste flavors the coffee flawless and we don't even have to use a lot, couple of pumps is plenty! We always kept 2-3 bottles in reserve since at times this syrup becomes unavailable but thanks to webstaurant, we don't have to worry about "out of stock" anymore. 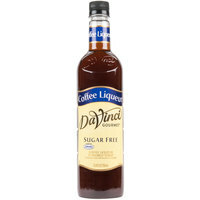 The DaVinci coffee liqueur sugar free flavoring syrup is a winner. The syrup is boldly flavored and very rich and decadent. The syrup is perfect for making coffee flavored milkshakes. This was the first time I purchased the "coffee liqueur" flavor for my husband's coffee. I thought it was strange to add coffee flavor to coffee but my husband enjoyed the syrup very much. Webstaurant has great prices for coffee syrups. It tastes like coffee flavoring. The ones who enjoyed this liked it best in hot cocoas. It would have been better if something other than splenda had been used in it. This DaVinci Gourmet Coffee Liqueur Sugar Free Flavoring Syrup adds just what we were looking for to our mudslide smoothie. Great taste and easy to use. A plus on this product.. I used these for an espresso bar at my sister's wedding post-reception, and have catered a few events since! Starbucks sells these for more per a bottle, so this great price makes it even sweeter! These syrups make great-tasting drinks that are super easy to make!